For the first time, the World Book Fair in the Indian capital (Jan 7-15, 2017) has a stall devoted to Meher Baba and it is a big draw from Day One. Sridhar Kelkar, chairman, Avatar Meher Baba Perpetual Public Charitable Trust, AMBPPCT, considers the response of the general visitors to the stall as a facet of Baba’s manifestation. Set up by the Delhi Centre, the stall stuffed with books, photos and brochures, is tucked between the giant stalls of leading publishers who have come from all over the globe. First day of the World Book Fair, 07 Jan 2017 was as exciting as any Baba enthusiast would imagine. Few got up too early, while some could not sleep the previous night. This was the first time that Delhi Baba Centre was participating in such a big platform like World Book Fair, where the footfall in nine days is expected to be over one million. Right from the word go in October 2016, despite opposition, albeit some minor, the project appeared to be on a trajectory of its own with the officials of National Book Trust, the host, cooperating more than what they usually do and Hyderabad, Pune and Mumbai Centers more than willing to send the Baba books on credit and making very special efforts to ensure that they reached us well on time. There was a Baba lover who had come to the Center two weeks back and he with his friend designed all the graphics. Each One was doing their bit with designing the stall, organizing the official requirements, packing the boxes, transporting them to the venue, arranging the change cash, getting the bill books printed, and all…. Baba was in the driver’s seat as usual and the caravan appeared to move with a steady speed of its own. We were just passengers. The Stall was opened at 1015 with opening of the cloth shutter, which the organizers had told us to use. Our neighbors became friends the previous evening itself. The Big Picture of Baba was garlanded, TV was installed on the stand and the extra cartons were put aside and the stall was ready by 1035. Then Baba’s prayers were done with one very zealous lady shouting Avatar Meher Baba ki Jai forgetting that this was not Meherabad and that we were not at Amartithi. But these had their own impact on the nearby stalls. They thought we were a bunch of overly happy kind of people who had no other work. While at 1100 official inauguration by a minister was taking place at the designated auditorium, we were busy planning how to engage onlookers, visitors and Book buyers. We decided that we would talk to everyone who would even pause at the stall. The first English and the first Hindi books were purchased by two among us and then we were ready. There was one guy who was looking for law books and our volunteer said, “Yes you have come to the right place, we have books on love”! He smiled and went off, but the glance of Baba’s picture did not go unnoticed. Many people were so impressed that we had a simple stall and we were not doing any propaganda and did not push anyone to buy. One youngster came and said, “I had been praying to Baba to buy Baba books and that if only there was a Baba stall, knowing well that neither Baba stall would be available nor His books. The happiness on his face seeing the Baba stall was really touching. He bought books worth Rs 1100/- and he was himself a poet. There was an elderly gentleman and he too was amazed to see the stall and what he told us, amazed us all. He said that he had Baba’s darshan in 1965 and due to some fight with a Baba lover, who was a lady he did not go to Meherabad again. He had also visited the Baba center at Delhi three years back and he too was tremendously glad to see the Baba picture and the stall. There was another lady who follows another Master but had heard about Meher Baba two weeks back and had wanted to buy few books on Baba. She too was engaged well by the volunteers and she too purchased books worth Rs 635/- on credit! There was a Pranic healer who wished to buy Baba books because his preceptor had been extensively quoting Meher Baba. 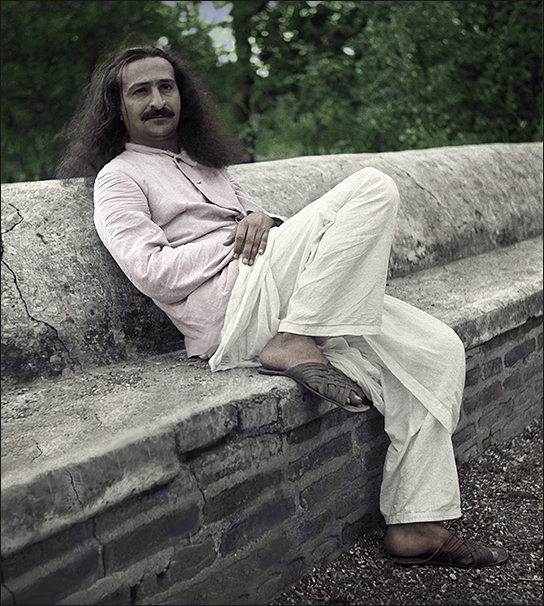 He took interest in Meher Baba Calling and was told, open any page Baba would give you a message and to his surprise he opened a page which touched him and his satisfaction could not go unnoticed. He too purchased few Baba books including MB calling! A Dy Commissioner of Police, Delhi city, too visited the stall and his eyes were gleaming with a smile and then said that he too had visited Meherabad and was more than glad to see the Baba stall. His son who appeared reserved, said he would visit again and buy Baba books. The stall was to be closed by 7.50 PM and the last visitor was to be allowed inside only until 7 PM. This man who stopped along with his wife asked so many questions on spirituality and finally bought Discourses. He seemed genuinely interested in God. The young couple was highly infused with enthusiasm on buying the books. There were scores who were given Baba life sketch, Baba calendars, and pamphlets. To all the officials of National Book Trust Baba booklets were given. The effect of the stall is really far reaching. There were so many who knew Baba from YouTube, online library of the AMBPPC Trust and many through their friends or relatives. There came an old man with a walking stick and said, “I wish I was also young. You all look so happy and cheerful and peaceful, which is really the grace of This Master of yours. You all are really blessed.” There was another old man who stood and watched Baba movie silently and told, “I see so much love coming from Him. Can I stand here watch in full”. He not only stood and watched the Baba movie which was being in loop continuously; he also took many free Baba pamphlets and Booklets in English and Hindi. Second day of the World Book Fair, 08 Jan 2017 began with the prayers again.. Those of us who reached early had to wait until the gates were open. Once let in at 1030, the stall was quickly opened and books arranged for sale. Being a Sunday, the rush was more. One lady who was following another Guru came especially on coming to know about the stall from her friend, who had visited the stall the previous day. She was too excited to see the Baba stall and bought books worth Rs 4000/-. There were many youngsters, college students, who came to ask about Him. One Engineer, who had graduated a year back, was interested in buying one book of Baba which could answer all questions. He was looking for a best seller type of a book which has a winning formula. He bought Discourses. When the stall was about to close, a gentleman came who had seen the Baba booklet in Iranian Stall in the Foreign Section and he purchased two issues of Glow and a few Baba books. In the noon, there was this spiritual guru from Vrindavan who came with few disciples and said that he has internal connect with Baba. He would not touch money and he bought Mehera (in Hindi) and other Baba books. One youngster came and he handed over the phone to talk to his bro who is a Hindi Teacher and wanted Hindi books. He went off and came back in the evening and took three books in Hindi including Akhand Jyoti, Hindi translation of Discourses. Overall a satisfying day. Day Three at the World Book Fair, 09 Jan 2017. The team was more organized.The rush appeared to be less but there were enough inquisitive visitors to keep us busy. The first visitor was a middle aged lady who saw the video of Meher Baba bathing the lepers and bowing to down to them (on You Tube) and believed that such a person has to be really divine. Her happiness knew no bounds when she saw the Meher Baba stall. She spent a lot of time and bought Meher Baba Calling. She was gifted a Meher Baba calendar. There was another amazing encounter with a fresh B Tech Graduate, who had read God Speaks as many as 16 times. He had come to buy Discourses. He was so inquisitive that he had a 45 minute session of Q&A with one of the volunteerss and finally promised to visit Meherabad. Just before leaving he took out his mobile and showed Meher Baba’s picture as his screen saver! There were many such visitors and one Sardarji, who was well settled in life came and gave his address and said that they are running a newspaper in Delhi and Maharashtra and would be glad to publish any Baba programs news like Amartithi. There were many more visitors who wanted God Speaks and other Books in Hindi. Overall a very satisfying day. Day Four at World Book Fair, 10 Jan 2017 started slowly. It appeared that there might not be any rush. but we were pleasantly proved wrong. A gentleman, who identified himself as Banerjee was so serious in his search for Baba books, it appeared as if he would squeeze out the entire knowledge from the Master. He was the first to ask for Baba’s work with Masts. Wayfarers was not available, however, a small booklet on Baba’s work with God-intoxicated from Mumbai Centre was available, which he purchased. He bought God speaks, Discourses, and Glow International. His picture and details were taken. A lady Sulekha, about 55 years or so, came and stood in front of the stall and said, ‘Since the morning there is a force which has been pulling me to the Book Fair. There is so much energy here. We asked her, ‘are you a psychic’? She replied: ‘No, I love living in such an energetic atmosphere.’ She bought Discourses and took a Baba calendar. A senior lady, Abha Bhandari, came with her son and said, ‘I feel so happy to be here, because I have seen Baba as a child. I have my pictures with women mandali as well.’ She said that she would share the pictures with us. Another gentleman, Manish, came and wanted to know about Baba’s interaction with Hollywood producer and wanted to know his name. When the name (Gabriel Pascal) was given, he said he is very much interested to make a movie what Baba wanted to make! He purchased Glow. One Hindi speaking visitor argued about the concept of Avatar and he was given, Ishwar Vani as a gift. There were so many of visitors who took Baba’s name and purchased books. The day ended with the satisfaction of seeing His divinity manifesting.